I waited for three weeks to write a 1000km round-up blog. And when Ananya actually hit that 1000km mark, I missed it. By the time I noticed, she had done 1004! Missed out on the photo-op! Next target was 2000km. And when she actually hit the 2000km mark, I was not in the best mindset to click a pic! So, now that Ananya has done 2100 kms, I thought I will share how it has been till now..
After giving Ananya her voice, Kishan and I went on our first drive outside the city. It was meant to be a short trip to Hesaraghatta Grasslands. I was eager to check out the Bridgestone’s behavior on both tar and mud. What happened in Hesaraghatta Grasslands later is worth another story altogether. When we reached the grasslands we realized it had just rained and Ananya could now taste some dampness too. The Bridgestone picked up mud in no-time and started skidding over the grass. I managed to keep her in control with some effort. We then hit the Bangalore-Pune highway at around 7pm. The idea was to drive down to the Café Coffee Day in Dobbespete. For the first time I go to know the vehicle’s behavior on a highway. The stretch between Nelamangala and Dobbespete is crowded with trucks. Still, I could maintain a good speed of 80kmph without facing any issues. On certain stretches, I did push the accelerator down to help Ananya hit 110kmph mark. The engine is surprisingly smooth and the cabin noise is comparable to that of any diesel sedans in the same price range. The soft-top, however, does flap quite loudly once you cross 80kmph. Although the noise is not deafening and you can still hear music without any loss of sound effects, the noise does irritate you after a while. The solution is to wind down both the side-windows a bit. This causes some amount of air to enter the cabin and counter the wind that hits the soft-top on the outer side. My experience with driving without A/C and with the windows rolled down has never been good. Since I suffer from sinusitis, exposure to constant wind causes severe headache. Thar’s cabin design and seat position are such that the wind doesn’t hit the driver directly. Now, I prefer to drive on highways with the windows rolled down a bit. Not only I’m avoiding noise from the soft-top, I’m also saving some fuel by keeping the A/C turned off on highways. 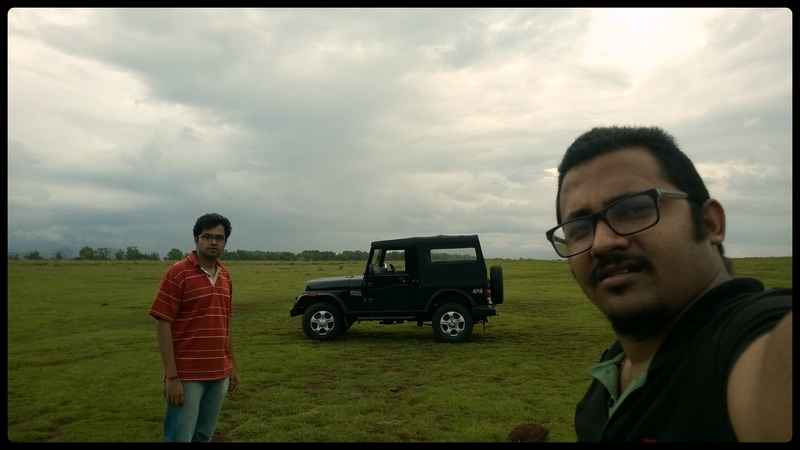 The next weekend after purchasing Thar, Kishan and I hit the road along with Praveen. This time I took one of my most favourite roads – the erstwhile NH-48 (Bangalore – Hassan). The ride was brilliant, so was the ride quality. The seats are comfortable for long drives, although a little more support for the thighs would have increased the comfort levels by a large extent. I was able to constantly maintain 100kmph throughout and hit 120kmph once in a while. Since we stopped at multiple locations measuring time taken to cover the distance wouldn’t hold good. My guess is that we were able to cover Nelamangala-Hassan stretch in 2 hours 15 minutes. We picked up Harish Gowda and his friend in Hassan and headed towards Sakleshpur. I wanted to drive down the ghats till Gundya and then again up the ghats overnight. However, Harish insisted that he can’t join. I decided to drive till Donigal. The idea was to have Chapatis or Neer Dose at one of the tea-shops in Donigal. However, on reaching there we figured out that these items are not served anymore at night. Disappointed, we headed back to Hassan to drop-off Harish and his friend. While the road between Hassan and Sakleshpur is well laid, that between Donigal and Sakleshpur is marked with potholes occasionally. My fellow friends sitting at the rear started cursing me after a while and asked me to slow down. The experience at the rear was apparently harrowing. However, being at the driver’s seat, I never faced problems. Fog started causing troubles and I had a tough time figuring out the right temperature and air-flow combination so that I can demist the windshield. A marginal change would cause mist to settle down on the other side of the windscreen. I also felt that on two-lane highways, the amount of light wasn’t enough. We dropped Harish and his friend at Hassan and headed towards Bangalore at 1:30 am. I thought we can have something at Kamat, Udayapura. When we reached there, we found the hotels closed and had to drive down till Bangalore without anything to eat. We reached Bangalore at 5:30 am and a whole night of driving had left my ankles in pain. The driving position is the actual culprit here. If I fix the seat position such that I can floor the clutch pedal and comfortably handle the steering, I can’t operate the accelerator with comfort. If I fix the position to operate the accelerator pedal comfortably, I can’t floor the clutch pedal and my hands stretch out completely to handle the steering. Something I’ll have to figure out how to handle.